The LDPF63000 model has been discontinued. Please see the LDP1 Series as a possible alternative or contact our Flow Engineering department. The LDPF63000 Display is a versatile display that can increase productivity by offering the plant floor or production area a large visual display of their current status. Whether your measurement is rate or count, the LDPF63000 can satisfy your requirement. 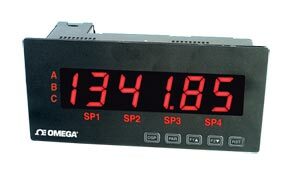 These LDPF63000 displays accept various digital inputs through the use of input modules that allow the unit to adapt to most any application. Additional plug-in option cards can add alarms, analog output, and communication/bus capabilities, making the LDPF63000 a truly intelligent panel meter. DIP switch selectable to accept pulses from a variety of sources including switch contacts, TTL outputs, magnetic pickups and all standard sensors. Dual Count Modes: When any dual count mode is used, then user inputs 1 and/or 2 will accept the second signal of each signal pair. The user inputs do not have the Logic/Mag, High/Low Freq, and Sink/Source input setup switches. The user inputs are inherently a logic input with no low frequency filtering. Any mechanical contacts used for these inputs in a dual count mode must be debounced externally. The user input may only be selected for sink/source by the user jumper placement. Connections: All wiring connections are made to the module via high compression cage-clamp terminal blocks. Wiring instructions are provided. Construction: Steel front panel, enclosure, and rear cover with textured black polyurethane paint for scratch and corrosion resistance protection. Sealed front panel meets NEMA 4 (IP65) specifications for indoor use when properly installed. Installation Category II, Pollution Degree II. Panel gasket and keps nuts included. Life Expectancy: 100K cycles min at full load rating. External RC snubber extends relay life for operation with inductive loads. (Free download) Allows configuration of the LDPF63000 meter from a PC. This software offers standard drop-down menu commands, that make it easy to program the meter. The unit program can then be saved in a PC file for future use. A serial plug-in card is required to program the meter using the software. 참고: Sofware is free, vist our download page. Comes with complete operator's manual. Adding option cards-meters can be fitted with up to 3 optional plug-in cards, however, only 1 card from each function type can be installed at a time. The function types include setpoint alarms, analog output and communications. The cards can be installed initially or at a later date. Each optional plug-in card is shipped with installation and programming instructions.